Kansas City, Mo. - The Flexographic Technical Association (FTA) recently recognized Tension Corporation for its expertise and print quality in flexographic printing. 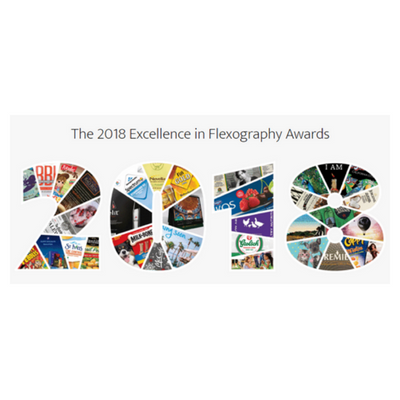 Tension was awarded two FTA 2018 Excellence in Flexography Awards. Excellence in Flexography Awards are presented to web, combined corrugated, preprinted linerboard and envelope, self-promotion and non-traditional printers, and entries are judged on consistency, image sharpness, defect detectability and ink coverage. This year, 11 of the total 114 awards were in the envelope division that included four gold, five silver and two bronze awards. "We continuously seek to provide our customers with the best-quality products on the market," said Lon Robinson, Tension Corporation Director of Research and Development and 2018 FTA Hall of Fame Inductee. "It is an honor to be recognized by the FTA for the print quality of our products, because it gives our customers third-party validation of our quality-promise." The winners in the "Line, Uncoated Paper" category demonstrated excellence in the quality of registration and attention to detail. Judges commented that Tension's gold-award envelope had "great, solid coverage" and the silver-award envelope featured a "nice ink laydown at green color." A longtime leader in print quality, Tension has consistently received FTA awards for its flexographic printing. Tension Corporation, a privately owned and operated company based in Kansas City, Missouri, is a global leader in envelope products and packaging & automation solutions. The envelope division serves a wide variety of industries including financial, insurance and direct marketing, and works with third-party providers directly. Founded in 1886, Tension produces billions of envelopes annually and has regional plants and offices throughout the country and the world. Visit www.tensionenvelope.com for more information. Flexographic Technical Association (FTA), chartered in 1958, is a professional society dedicated to bringing all members of the flexographic printing community--printers, suppliers, consumer product companies, institutions, prepress houses and others--together by providing opportunities for the free exchange of technical ideas and discussion of mutual concerns. It is a proponent of maintaining and advancing quality standards and includes 1,650 member sites that represent more than 1,400 companies and 60,000 individuals. Foundation of FTA, founded in 1974, is the educational arm of FTA and is dedicated to supporting and advancing the flexographic printing industry. For more information visit www.flexography.org.